Because of a lack of time management on my part this week I have combined a couple of challenges - a Colour Challenge & a Sketch Challenge. 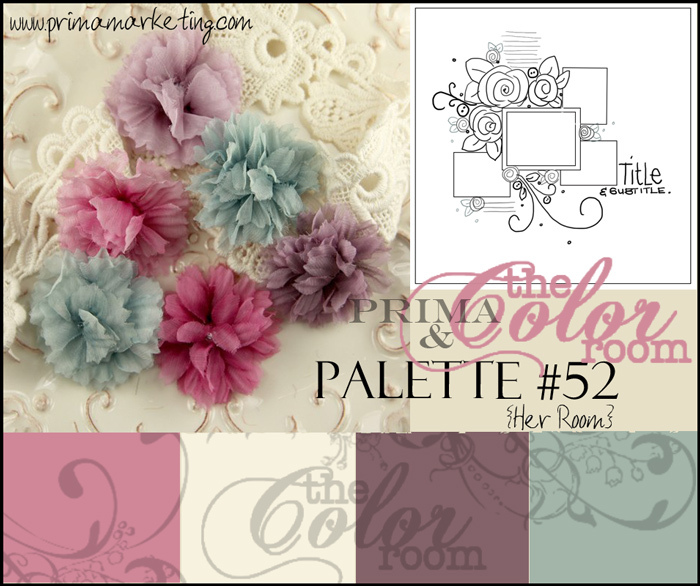 The challenges that I have combined are The Color Room with there 1st Birthday this week offering Challenge #52 and a very exciting new sponsor................... my favourite PRIMA!!! 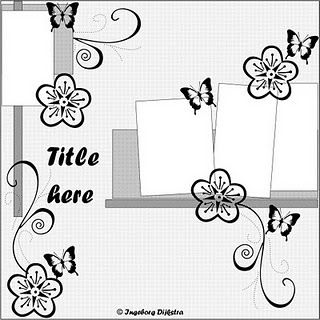 I have also created my LO on my translation of the sketch from Scrapbooking Competitions Blog. This is the gorgeous sketch.............. this sketch fitted me so well with my love of all things flowers & butterflies!!! This is the LO that I have created. I have used a photo of my gorgeous girl Mackenzie that was taken over the weekend. The colour of Mackenzies swimmers tied in so well with the colour palette. The image on her swimmers is roses that are shades of pink, purple & teal - this doesn't show up all that well in this photo, however it is more prominent on the LO. I love using the tear in the page and putting a contrasting paper under it, however I don't really like to leave it empty so I have added this very sparkly butterfly and then added a row of Kaiser roses as the colours work perfectly. I have used a packet of the beautiful Prima pearls on this page and just cut them in order to make them go further. I have used a mix of both Prima & Kaisercraft flowers on this page. I love this little pink butterfly. It is made out of feathers and is really cute! I have used some crochet lace along with the pearls & the gorgeous Prima Flower. The white paper that I have used on this LO is embossed & is absolutely gorgeous. It has a metalic finish to it and just pops off the page. For my title I have used a combination of Chipboard and Sticky bling words. The chipboard was just raw chipboard and I covered it with a paint dabber and then added some cotton candy glitter to it. I love the Glittery finish. I like how it adds a bit more dimension to the title! The lacing in this LO is a technique that I came across yesterday. I loved it so much that I had to use it in the LO. It was my first ever time doing this sort of lacing and I must admit it took me ages and I was ready to give up half way through, but it looked so good that I couldn't. I have to attribute this gorgeous technique to the wildly talented Natasha over at My Moments of Tranquility. I really enjoyed doing this LO, it was a mix of the colours I love with the elements I love. Thanks so much for taking the time to look. I hope that I have offered some inspiration. Don't forget to enter my blog candy giveaway while you are here. This is so gorgeous, Samantha! I see something different every time I look at it.